POWELL RIVER, BC – Townsite Brewing has announced the release of the next installment in an annual series of beers inspired by a unique local landmark. The series was initiated in 2012 with a Belgian Tripel called Charleston – which was subsequently promoted to become an annual seasonal release – and continued in 2013 with another Triple called YOGN 82. For this year, the series is offering Cardena, a 10.5% abv and 30 IBU Belgian Quad that features a label designed by local artist Anna May Bennett. 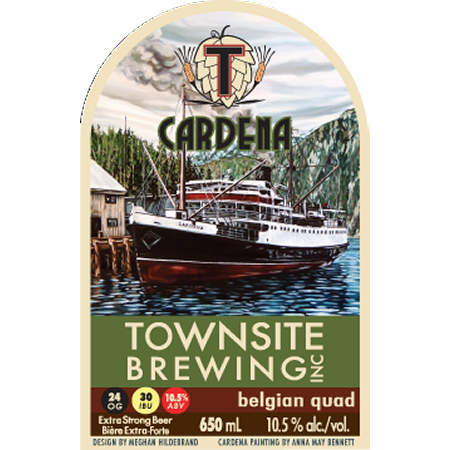 Townsite Cardena is available now in a limited run of 650 ml bottles at select private liquor stores in British Columbia.